I have been a swimmer for most of my life. But at this point in my life, I’ve been a lapsed swimmer for probably about as long as anyone reading this blog has known me. For a long time, that was a really good thing… in some ways, swimming (especially at the level of commitment I was at) added a lot of stress and anguish to my life that I was happy to get rid of when I finally quit competitive swimming my junior year of high school. But as almost any swimmer will admit, swimming defines you. Even though I haven’t swum competitively in 3 years, I still identify myself as a swimmer. I keep up with competitive swimming–yes, there is more than just the Olympics–, carry with me many lessons and good habits I formed because of swimming, and use words like “interval” and “taper” in different ways than most people. Two weeks ago, I got back in the water for the first time in two years. That is an embarrassingly long time. I was worried at first that I would’ve forgotten how to do a flipturn or the correct technique for freestyle, things that used to come second nature to me. But my first 100 yards were surprisingly effortless. After that, though, I found myself winded and weak. I had to shorten my sets so I’d be able to get through it, let alone have a good workout. That was really embarrassing for me, a huge blow to my pride. Here I was, unable to get through distances I used to consider a warm-up, when I was once able to race two miles. Since that first workout, I’ve gone to the pool a few times, each time growing stronger, able to swim longer distances, and more attentive to my technique. I’m also working on a pretty sweet swimsuit tan. I know I have a long way to go… that much has been made perfectly clear. And with every workout, I have to constantly suppress my pride–if I listened to the voice in my head that whispers “Keep going! You used to be able to swim two hours straight!”, I’d injure myself for sure. I have to take it one step at a time; I’ll get back to a comparable level soon enough, but not without weeks and months of doing less, yet more and more. For now, it’s back to the days of being unable to lift my arms to shampoo my hair after a workout and smelling like chlorine all day. At least this time around, no one is forcing me to swim butterfly. Being in Austin these past few days has been really awesome. I’m all moved into my new apartment (with some notable exceptions… but all the big items have been moved! ), the 3rd roomie is moving in today, and my brother comes up tomorrow to move into his dorm! This week has been filled with campus-area shenanigans… Catching up with friends I hadn’t seen since March has been wonderful, and I’ve started working out with ambitions of being ready for a triathlon next year. Being back in the water has been great, but kind of painful and humbling. We have 2 new FOCUS missionaries at UT and we’ve been giving them a Texas-style welcome; it looks like the addition of this ministry at the Catholic Center is going to be fulfilling and exciting for everyone! I’ve gone to see 2 movies (doubling my summer’s previous quota of cinema time). The verdict: Crazy Stupid Love was absolutely wonderful, so wonderful that I was tempted to sneak into the theater showing it the next night instead of seeing The Rise of the Planet of the Apes, which was better than I expected it to be, but overall mediocre. My days have been a bit hectic with running around trying to get errands done and meet up with people, a process which has been a bit complicated by the fact that we don’t have internet at the apartment yet, so I have to dash around town stealing borrowing wireless from friends and/or the Catholic Center (my current location). After our network is up and running and I start to get settled into a school routine, I’ll start blogging more regularly (hopefully). I’m still trying to figure out what my blogosphere niche should be now that I’m not in Germany–if you have ideas, holla! Hey friends! I’ve been toying around with my layout a bit… I like what I’ve ended up with, because it’s simple and interesting, showcases one of my Europe pictures (the city pictured is Vienna, by the way–one of my favorites), and doesn’t have that annoying flowery thing I’d had before. Let me know what you think! I just helped my dad pack up our van with, among other things, all the clothes I’m not tired of from wearing for 5 months straight in Europe and my brother’s old loft bed, all ready to move me into my new apartment tomorrow! I’m really excited to have my own place and to live with three of my best friends this year. I’m also excited because we just had my mom’s old bike (probably as old as me) re-tooled so I can use it at school! I’m hooked–the thought of not having a bike at school is almost ludicrous to me. It’ll also come in handy when I start training for the triathlon I’m planning on doing in the spring! I’ve never done one before, but I have a background in swimming and have run a half marathon, so this seems like a semi-natural step. Getting back in the water after a 2 year hiatus should be weird, but hopefully worth it. My brother is going to be a first year at UT this year, so in addition to getting myself ready to start a new semester, I’ve been kind of tagging along on for some of the freshman year preparations. Predictably, I’ve also been confused for the freshman in the family at Kohl’s. It’ll be great to have him in Austin this year! In addition to being awesome and fun, he will also be the source of dining hall meals for me. Yes. Just as I’m on the cusp of starting the next chapter, my uncle sent me this fantastic reminder of my last chapter. Check out Part 1 of this photo essay about Freiburg, which they’re calling the “City of the Future.” This guy did a much better job of capturing some of my favorite places than I was able to! It’s like I never left… the picture with the “Platz der Alten Synagogue” shows the intersection leading from the university to the path I’d take to get back home, and the so-called “street café” is the Uni Cafe, which has the best salads and Flammkuchen in Freiburg. I can’t wait to see the next parts of this project! Yesterday at 3 PM Central time, after about 36 hours of traveling, I made it back to Houston. It was a pretty crazy two days that I’m sure will be funnier in a few months than they seem now. The important thing is that I’m back home with the fam, have already enjoyed some pink lemonade and Mexican food, and am looking forward to a busy week full of catching up with friends, doctor’s appointments, shopping, packing, unpacking, and moving. But before we get into all of that, I guess I’ll give you guys a rundown of the craziness that was my departure from Freiburg. I should have known that the whole ordeal would be insane when the public transit workers in Freiburg decided to go on strike last Friday. Now, I rarely used the Straßenbahn network or bus system because of my bike, so normally that wouldn’t have been a problem. But Friday happened to be the exact day that I needed to move out of my dorm in StuSie and take all of my luggage 30 minutes across town to my friend Elysia’s apartment. The strike situation complicated that quite a bit. So after my room was inspected, I strapped my huge hiking backpack onto my back, wore my school backpack across my chest, piled my bags of souvenirs on top of my 50 pound rolling suitcase, and trudged across StuSie to my friend Marie’s dorm, where she had agreed to let me leave some of my stuff while I worked on figuring out how to move it. I had packed all of the stuff I’d need from Friday until Sunday (the day of my departure from Freiburg) in my backpack, so I decided to take my huge suitcase and souvenirs over to the Hauptbahnhof, where they have storage lockers, so I’d have it off my hands. Because of the strike, the easiest way to get to the Hbf was to walk. Normally, that wouldn’t be so bad, but everything’s a little bit harder with a 23 kilogram suitcase. The normally 20 minute walk took about 45 minutes, but paying the 4 Euro to put that bad boy away for 24 hours was worth it. After my walk back to StuSie, I once again strapped my backpack on and loaded my schoolbag onto the back of my bike. I rode over to the university in the rain (thank goodness for backpack rain protection!) to meet Elysia after her exam. Because her apartment is so far away from the Innenstadt, we split a cab. The next few days were filled with stressful errands like selling my bike (finally done! ), last-minute shopping, and mailing things back home. 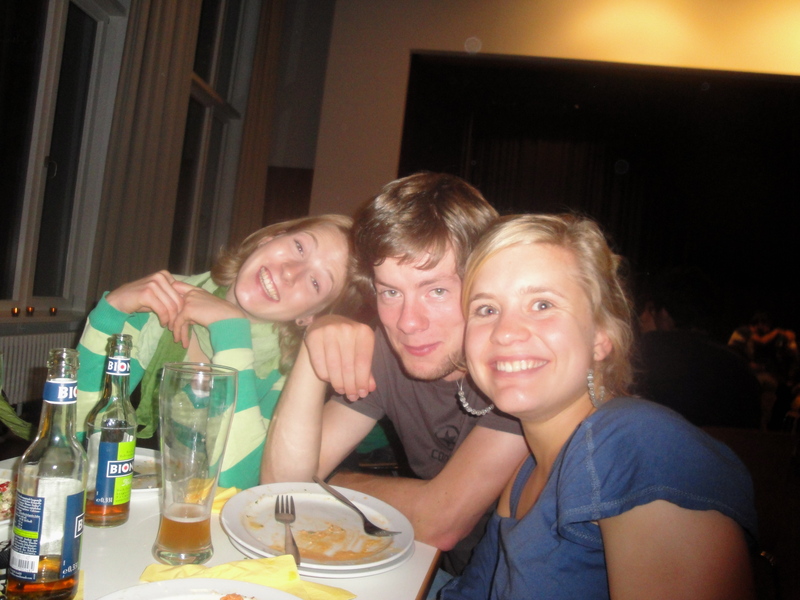 Despite these annoyances, I was luckily able to enjoy my last days with friends… I went to my friend Konstantin’s Abschiedsparty before he leaves for Italy, which was kind of like my Abschiedsparty as well. My wonderful friends gave me a book of German fairy tales that they’d all grown up with for me to read and think of them–it was a really nice gesture and provided for some good airplane reading, though I might have attracted some weird looks for reading a picture book. My last day in Freiburg, Elysia and I went on a hike up the Schönberg, which is right near her apartment. 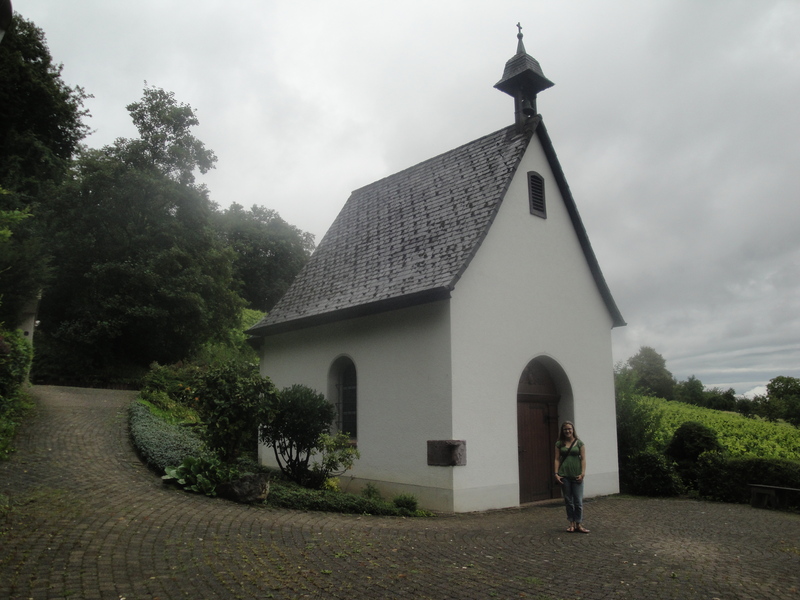 Much to my surprise and delight, it led us right to the Schönstatt shrine, which I hadn’t visited in awhile! Our Lady definitely gave me some grace during my short visit, which I’d need in the coming days. Sunday morning, I (with the help of Elysia) had hauled all the rest of my stuff to the lockers at the Hbf, so I wouldn’t have to worry about it. The last thing I did in Freiburg, which I think was a really good decision, was to to Mass at the Uni Kirche. 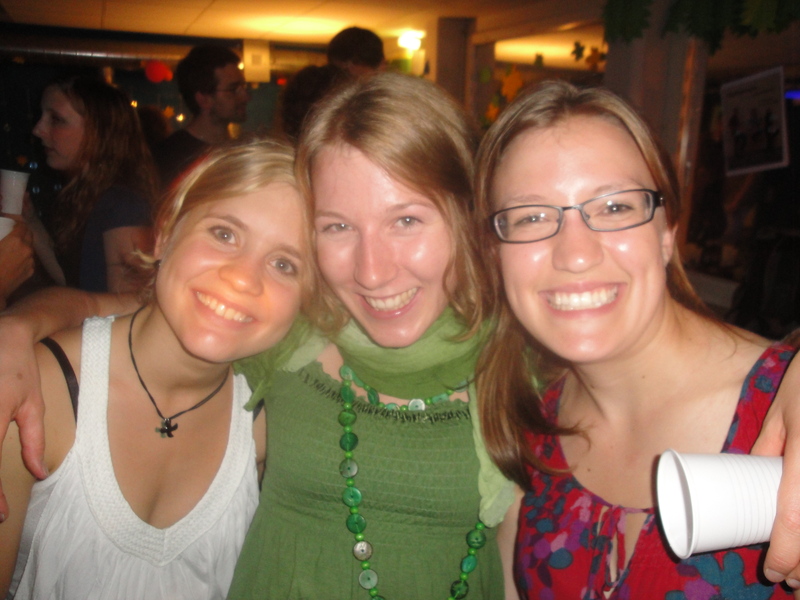 My friend Leonie and her sister were both there, so it was nice not to sit by myself as I did on so many Sundays. After Mass I said lots of last good-byes to my friends, but since I had an extra hour to spare, a few of us decided to go get a drink. This was ultimately a good idea–I got to spend some quality time with a few of my friends, spend the last of my Euro “Kleingeld” (much to the dismay of our waitress), and enjoy my last legal alcoholic beverage until March! However, the service was really slow so we ended up chugging our beers, running to the train station, yanking my stuff out of the lockers, and dashing to the platform to make my train. I stayed the night in Basel, where I was supposed to fly out the next morning at 10:30. Because of past airport debacles, I got there in plenty of time… only to find out that rainstorms in Frankfurt, where I was supposed to connect, had delayed our flight by quite a bit. At first, I wasn’t too concerned and decided to spend the time charging my computer and watching episodes of Friends which I had fortunately put on my hard drive before departure. However, once the delay reached the one hour mark, I started to get a little concerned, because I only had an hour and 15 minute layover in Frankfurt to begin with. However, the stewardesses assured me that all the flights out of Frankfurt were delayed as well, so even though I might have to rush, I’d probably make my connection. Upon landing in Frankfurt, I located and info phone and inquired about the Houston flight, only to be told by an all-too-calm operator that the plane had already left. At this point, both the stress of just having missed my flight home and the fact that I was leaving the place that had become my home decided to kick in, effectively reducing me to a crying mess for a little bit as I tried to scrape up enough phone credits to call my parents and let them know what had happened. Then, I broke out the Friends in an ill-fated attempt to cheer myself up as I waited for my number to be called at the ticketing desk. I believe I was number 486, and when I first got there they were helping people in the 390s. In the nearly 3 hours that elapsed between calling home and being seen at the ticketing counter, my parents called Continental and rescheduled my flight, but were never given my new ticket number, which caused oodles of problems when I finally got to the desk–further complicated by the fact that I was tired, depressed, and generally a mess. After quite a while of struggling, I ended up with a free dinner and hotel room and a ticket on a plane to Chicago the next morning at 8 AM. That morning, everything went relatively smoothly. The new security questions that they ask you while checking your passport at the airport are a little strange, but thankfully the fact that I bought a scone at the airport did not disqualify me for boarding. Despite an abysmal movie selection on the plane, the transcontinental flight was quite comfortable and I was able to sleep for a little bit, cutting down on the jetlag quite a bit. Upon arrival in Chicago, I even got through customs pretty painlessly. However, at baggage claim it quickly became very obvious that my backpack hadn’t made it to Chicago, even though my huge oversized suitcase, with which it had been checked in Basel, had. When I asked airport personnel, they ensured me that it would be in Houston when I got there, but I was doubtful to say the least. Especially when I realized that, because I’d never checked that backpack before and had always carried it on, I had forgotten to put identification on it. And that it contained, among other things, souvenirs I’d bought in Krakow, Freiburg, and Schoenstatt, and my teddy bear I’ve had since I was 2 years old. Luckily, the American Airlines baggage people found it pretty quickly–it’s in Frankfurt and should arrive here in the next few days! So, sorry to those of you to whom I haven’t been able to give your souvenirs yet. So I’m finally back home and basically over jet-lag. Now begins my crazy week of being home, and then a new adventure begins in Austin! It’s so weird to me that my semester in Germany is already over–in some ways it feels like it lasted forever, but in some ways it went by in a second. It was one of the best things I have ever experienced in my life and I can’t wait to make my return to Freiburg! Leonie's birthday brunch. We aren't this blurry in real life, promise! 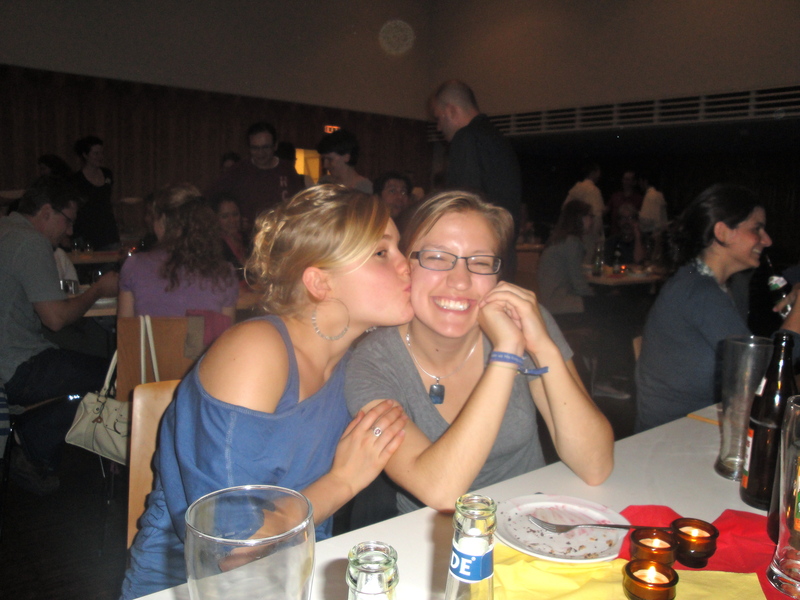 Yesterday was the last Mass and Gemeindeabend at the KHG. It was sad, but mostly really, really fun. There was so much amazing food, good company, and I got a good dose of home when the last of us gathered around the piano and sang cheesy songs until midnight. Some things are universal, I guess. 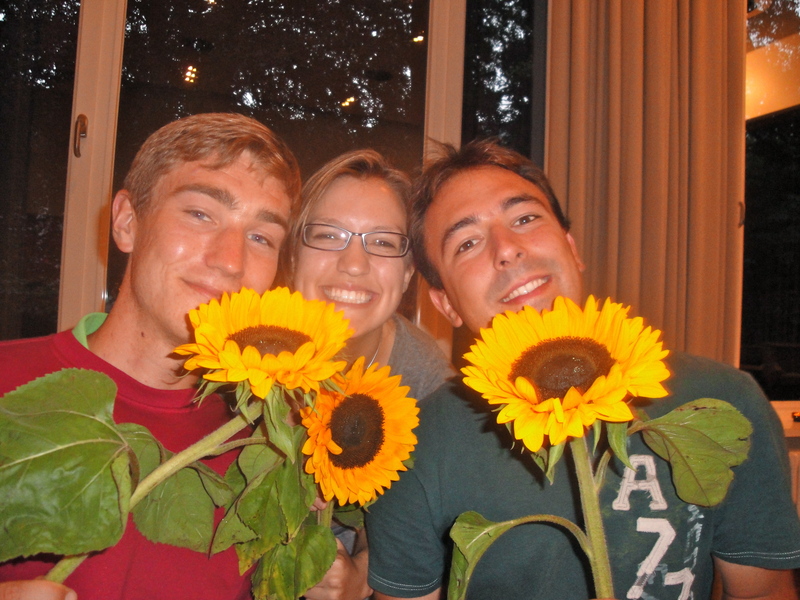 A good number of students from the KHG are studying abroad next year, so the Gemeinderat was really sweet and gave a sunflower to each of us who isn’t going to be here after the break. I’m leaving Freiburg Sunday night to stay in Basel until Monday morning, when I fly out. So my last hoorah is going to be Saturday night. My friend Konstantin is leaving soon, too, to study in Italy, so he’s having a party that nicely coincides with my last full day here. As weird as it is to say good-bye to these wonderful people without knowing the next time I’ll see them, at least my last few days here have been memorable. I’m gonna miss it here. 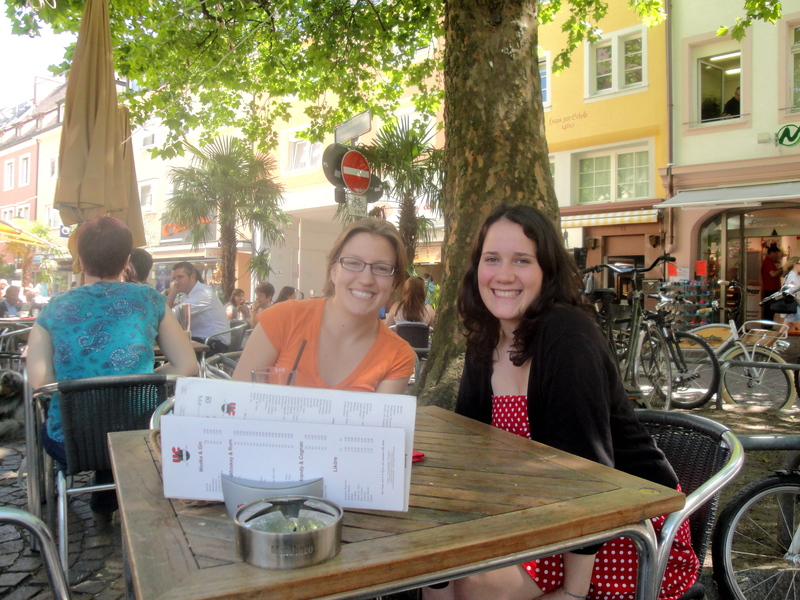 In my first ever blog post, I discussed the German phrase “auf Wiedersehen” and how it gave me some comfort in leaving Texas to come to Freiburg. First of all, no one really says “auf Wiedersehen,” in my personal experience. I have probably said it about four times in the past four months, two of these times being in this very post. I don’t know why, it might be a regional thing; otherwise, we’re being taught wrong in America. 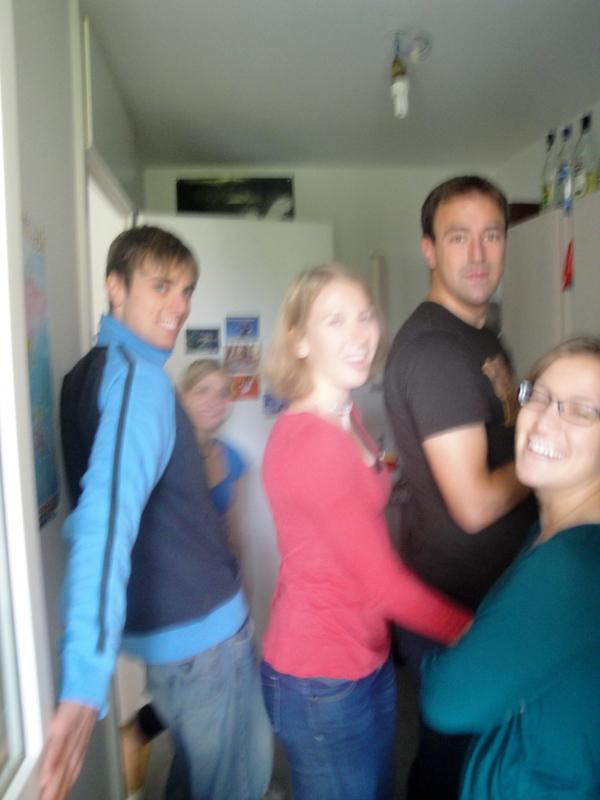 Anyhow, I’m getting ready to say goodbye to Germany. In about a week, a very jetlagged version of myself will be getting to Sugar Land and greatly anticipating my arrival in my very own bed. Part of me is very excited. But part of me really wants to stay here. A German friend described this phenomenon by saying that I’m leaving “mit einem lachenden und einem weinenden Auge.” One eye is laughing, and one is crying. That’s pretty accurate. One eye sees the coming year and can’t wait to see what it will bring. One eye knows that two weeks from today I’m moving into my first grown-up apartment and will be living with three of my best friends in the world. One eye was recently flooded with tears of frustration because I hate German school, and can’t wait to get back to the comforting sea of red tape that is the University of Texas. One eye can’t wait to read a restaurant menu with ease. One eye looks at my time in Germany and knows that it was a wonderful time, but it has to come to an end. But the other eye isn’t so optimistic. It cries because it’s seen how much progress I’ve made with my German since I’ve been here, and wishes I had more time to absolutely perfect it. Because I’ve met some wonderful people while I’ve been here, and I really don’t want to leave them just yet. Because there’s so much of Germany I have yet to discover. Because seven days from now, I’ll have to wait seven more months to enjoy a legal beer. My last week is going to be extremely bittersweet. Yes, I’ll be spending a large portion of it in the library. But given the fact that every day I’ve run into at least one wonderful, caring friend while studying, it hasn’t been too bad. I have a lot of errands left to do as well, but that isn’t so bad, considering that these odd jobs require me to traipse all over this city I’ve come to know and love, one last time. I have to clean my room and pack up all my stuff… that’s mostly sweet because I will be very glad to leave these twelve square feet of space I’ve called my home for the past four months. The bottom line is that this end of the “goodbye” is really, really hard, and I don’t have the comfort of knowing the next time I’ll be back here. I’m spending this last week saying my goodbyes to the city. But with every goodbye, I’m making sure to promise that I’ll be back. Because I know I will.